It´s May 1985 and Opertaion Red Hammer has begun! The Soviet First Tank Army crosses the border into Germany and strikes into the Eisenbach Gap, seeking to rip open the belly of NATO´s defenses. American and German troops scramble from their bases to try and delay the Soviets, for if they get through they would drive all the way to the Rhine. Over two thousand tanks will meet in the decisive engagement of the war. Soviet tanks thrust toward the vital crossroads of Gerzenburg. Blocking the Soviets´ way are the battered remnants of a West German-American task force. Will they be enough to stop the Soviet juggernaut? Now you command Soviet and NATO forces during the first battles of the Third World War. Seven scenarios give you the opportunity to explore the desperate fighting in the Eisenbach Gap and Gerzenburg, while the new asset-chit system lets you direct airstrikes, artillery, chemical weapons and gunships to achieve your vicories. Dawn´s Early Light Red Hammer is the expanded 2nd Edition of Peter Bogdasarin´s Dawn´s Early Light from the award-winning Corps Command system. Corps Command Totensonntag, the first game in the series, detailed desparate fighting between the Germans and the British during the World War Two battle of Operation Crusader. Dawn´s Early Light Red Hammer includes everything from Dawn´s Early Light, but with improved counters plus the expansion game High Noon at Gerzenburg. 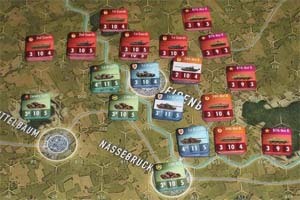 Dawn´s Early Light Red Hammer is easy to learn and play in an evening, so get ready to play the NATO or Soviet forces during Operation Red Hammer!